Drafts are for internal use only. 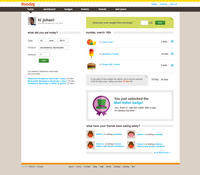 Foodzy.com is a new website that helps users keep track of what products they eat during the day. 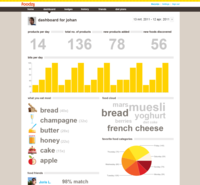 In return it rewards healthy and fun eating habits with badges and plenty of personalized food statistics. This way people are able to maintain a healthy lifestyle, start losing weight or simply keep track of their own and their friends' eating preferences. The site launched worldwide earlier this summer and as of today it is fully available in both German and French. Foodzy works with local food databases, so users only find food products from the country they live in. If a product is not available yet, users can easily add it. Up until now Foodzy was available in both English and Dutch, but the site's interface and food databases have been completely translated to French and German. 'Food is a local matter' says Foodzy's co-founder Marjolijn Kamphuis. 'That's why we've translated our default product databases and added hundreds of locally available products. Everything from Nusskuchen to Port Salut is now available for our users in Germany, Austria, Switzerland, France, Belgium and Canada. Users that regularly eat vegetables, fruit or fish will over time win special badges for their healthy eating habits. But Foodzy's primary goal is not to be all about health or weight loss: The best diet is to eat well, varied and enjoy food. Therefore it will also reward other - more fun - eating customs like a Birthday badge for eating cake on your birthday. Enjoying food with your friends and competing with them for special badges is where the fun and added value of Foodzy lies.